We know you've seen that commercial for Hot Buns. Sure it's a bit silly — but hasn't it made you want to try one? (Just admit it.) Okay, I'll admit it. I want to try one! I put two bun products to the test. I got my hands on the Hot Buns (once only sold online and over the phone, they are now available at stores like Wal-Mart and Walgreens for $10) as well as a Conair Bunmaker for a mere $3 at my local Target. Each product promised a beautiful bun in just three easy steps. For the $10, you'll receive two hot bun makers, one large and one small, in your choice of light or dark. I started with a ponytail and chose the large hot bun tool. Step one advises me to roll the hair around the tool in an upward motion. Sounds easy enough, right? I have thick medium-length layered hair, and I was given a tip that I'd need to take extra care to tuck in my stray layers as I rolled the hair. And those wayward layers started to give me trouble immediately. However, I was able to tuck them in easy enough to move onto the next steps — snap and wrap. Easy peasy. The wrap refers to an elastic ponytail attached to the tool that you use to tighten the tool and then wrap around the hair to secure the bun. 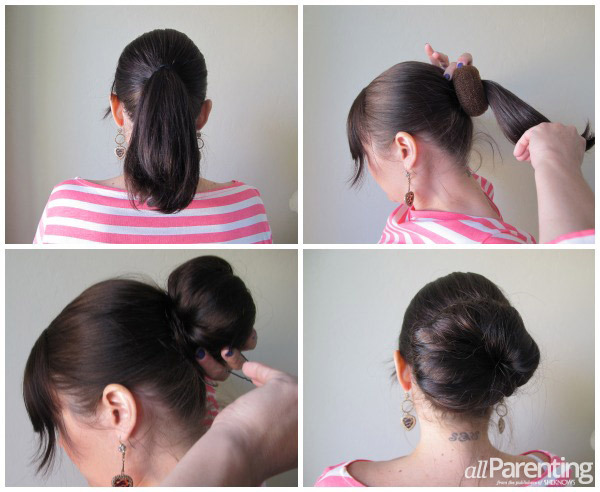 Finally, you spread your hair evenly around the tool to complete the bun. Voila! 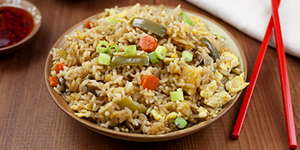 Interestingly, the box boasts three easy steps — roll, snap and wrap! However, included in the kit is a six-step how-to guide. No matter, I felt the Hot Buns product was pretty true to its silly and fun advertising campaign, and I was happy with my hot bun. Truth be told, I used a few extra bobby pins and some smoothing product to secure those wayward layers. This kit came with one elastic ponytail holder, one bun maker that looked like a kitchen scour-scrubber with a hole in the middle and four hair pins. 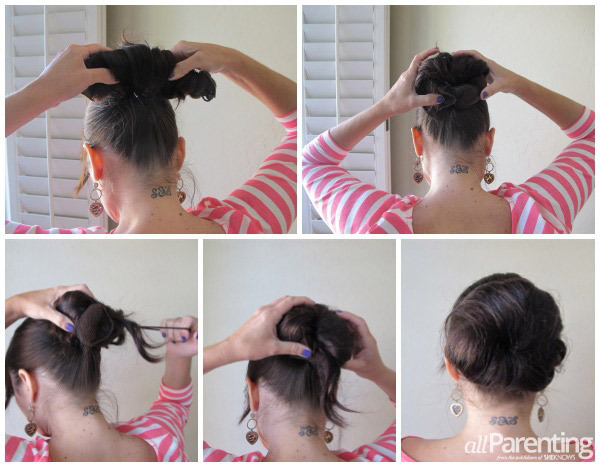 After putting your hair in a ponytail, you pull your hair through the bun maker and slide it to the base of the ponytail. Next, you are instructed to spread the hair over the bun maker. This was not quite as easy for me as it looked in the instructional picture. I used a swirling motion with my hair, tucked the end pieces under the bun maker and secured them with the provided hairpins. However, I needed way more hairpins than were provided in the package. I used all I had on hand — probably 10 or more. Even still, I think the bun turned out pretty cute. Neither of my buns turned out as neat and tidy as the pictures/advertisements, however. Perhaps you need to have longer, straighter and all-together much unrulier hair than mine to get that perfectly polished look. Nonetheless, I would give both products my thumbs up. The Hot Buns product is a bit pricier (still a very inexpensive hair tool, however) but gets extra credit because it is much easier and didn't require the extra pinning. For a busy mom who is looking for a cute, semi-polished and out-of-the-way hairstyle, I absolutely recommend picking up a bun maker! An added bonus? 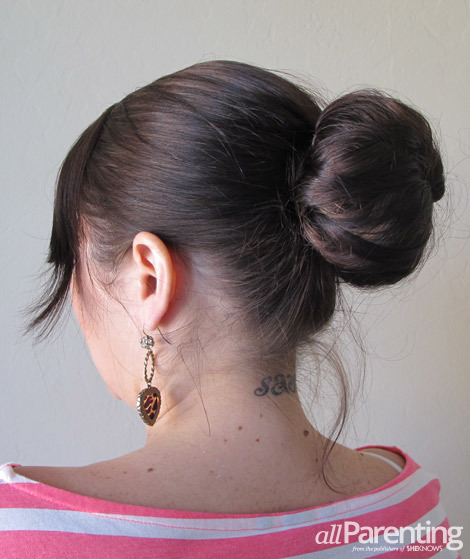 One of the helpful hints on the Hot Buns tutorial notes that the "best buns come from slightly dirty or damp hair." Done.